Really rich but non-greasy moisturiser. Skin feels very soft. Love that it’s in a refillable tin. Lovely product but in plastic not aluminium. This cream is wonderful! Very comfortable and light at the same time. Very thick rich cream, I use it on my feet for a deep moisturise. A bit heavy for use on my face in hot weather but will be great for the winter. 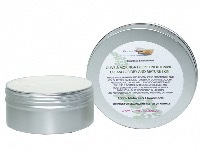 Lovely rich moisturizer without leaving skin feeling greasy.